The following introduction was written by a patient at Seattle Children’s Hospital who participated in the Writers in the Schools program. 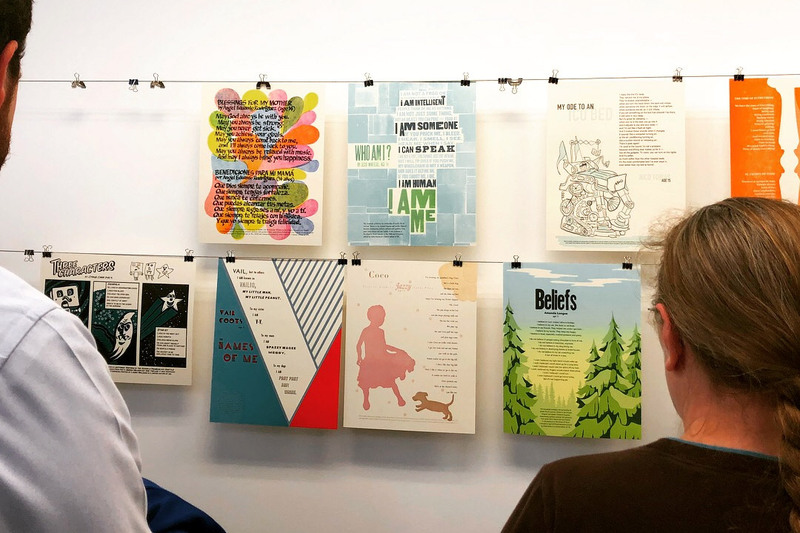 Her work was included in the 2016/17 WITS Broadsides, which features a collection of 20 hand-printed poems by students at Children’s Hospital on broadsides created by talented letterpress artists in a partnership with Seattle’s School of Visual Concepts. You can see them all in the current installation of the Community Gallery at Seattle Art Museum through September 2. I never realized the healing properties writing could have on a person. Being able to express your thoughts onto a page, without needing to worry about what other people might think about it, is freeing. When I let my mind wonder, I find myself writing down whatever is on my mind. Being in the hospital all the time can really take a toll on a person but having writing as an option can make you feel at ease. I wrote a poem last year that was published in the letterpress broadside project. This poem was about how I was diagnosed with Crohn’s Disease, and what I was going through at that time. While writing this poem with [WITS writer] Sierra Nelson, it made me feel lucky that I was able to reflect on that stressful time in my life. Putting down my thoughts into a poem made it feel whole, and not just some insignificant facts about what I went through. Writing poetry in the hospital showed me that, yes, when things are hard it can be especially difficult to look past it, but having that outlet to write down all my feelings made it therapeutic. When things are going well for me, I always want to write down what that feeling means to me. That’s what I love about creative writing: even if you’re sad or happy, it brings back all these memories to reflect upon. “I remember having my first surgery. It was an emergency surgery. I was just 6 at the time. I remember not remembering what happened. I remember waking up in ICU and not being able to move … I remember almost not leaving ICU. My doctor said I have a 50% chance. But then I got better. I remember all the nurses’ names. I remember them feeling almost like family … I remember going home and greeting my dog Pooka and seeing my room painted with butterflies, pink and purple … I remember feeling lucky and ready to take on whatever comes next.